In some regards, Happy End is a pseudo-sequel to Amour, with Jean-Louis Trintignant’s suicidal grandfather giving an almost beat for beat account of the latter film’s plot as his own back story, his misery over the death of his wife and his own fading intellect leading him to enlist the help of anyone who will listen to numerous failed suicide attempts. 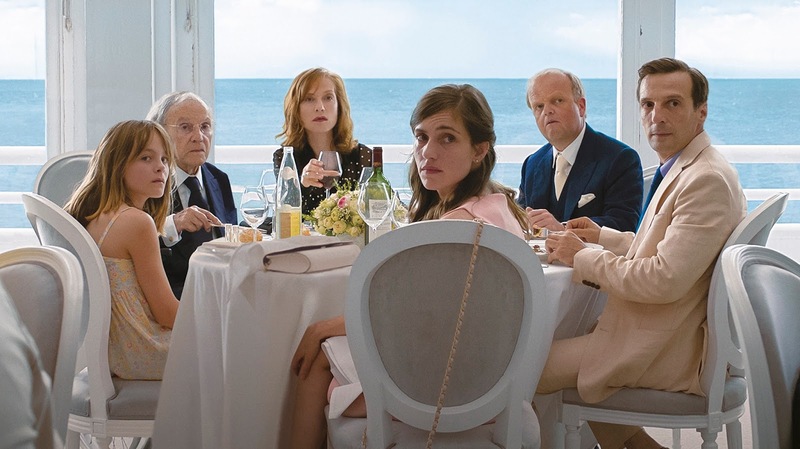 In Haneke’s world, this amounts to comedy, each attempt at suicide failing more spectacularly than the last, leading to ever growing problems for the family patriarch. The rest of the painfully bourgeois family isn’t much better off. Young Eve Laurent (Fantine Harduin) has just poisoned her mother with her own pills, streaming the entire event on Snapchat. She goes to live with her emotionally distant father, Thomas (Mathieu Kassovitz) and his sister, Anne (Isabelle Huppert). Thomas is having a torrid online affair with another woman, while Anne is struggling to keep her moronic son (and heir to their fortune) in line. All the while, their life is falling apart around them, thanks in part to a dangerous addiction to technology of their own making, while immigrants living all around them face a real struggle to survive. It’s all surprisingly on-the-nose for Haneke. His camera observes the action coldly, at a distance, not unlike his dispassionate framing in Cache, often utilizing cell phones and computer screens to put an emotional distance between the audience and the characters. This distance creates a disturbing lack of empathy, which is the backbone of Haneke’s rebuke of modern technology’s creation of artificial human barriers. Parts of this are surprisingly timely – Eve often sits zombie-like in front of a vapid, Logan Paul-esque Youtube star, and seeks to be just like him by capturing ever more dangerous content for anonymous viewers of her own. Yet Haneke seems less like an uncompromising social satirist and more like a pernicious scold, taking a one-dimensional “kids these days” position on modern technology. There are flashes of his formal brilliance, but this is Haneke at his most misanthropic, a cinematic equivalent of shaking a cane at the audience and yelling at them to get off his lawn. The result feels strangely neutered, curmudgeonly when it should be bitingly satirical, frustratingly superficial when it should be digging deeper into a subject that is seemingly rife with thematic content. 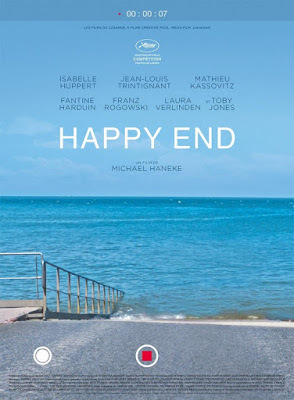 Happy End is a strangely dull and reactionary exercise in pointless nihilism that brings nothing new to the table to justify its own cynicism. It’s a dour blend of The White Ribbon’s cautionary tale of lack of empathy in the young and Cache’s stark critique of a connected world under constant surveillance. But it’s as if Haneke has nothing more to say about either subject, making for a chilly and intentionally distancing experience that punishes its audience for no other reason than for its creator’s own sadistic glee. 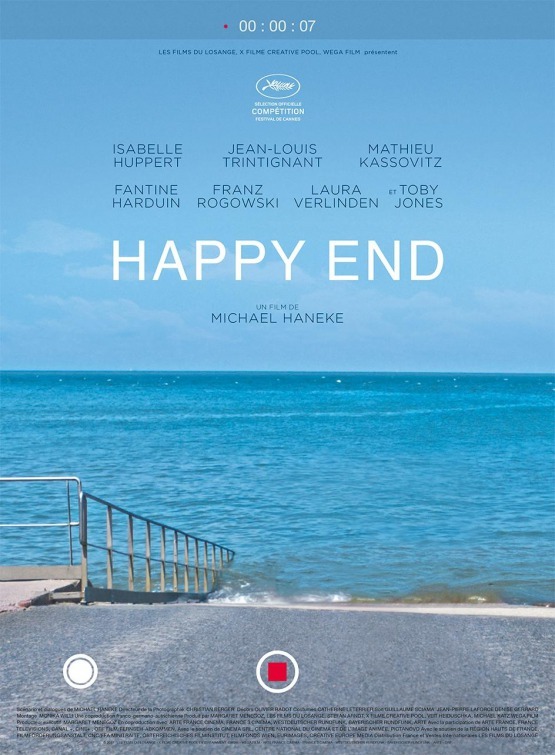 HAPPY END | Directed by Michael Haneke | Stars Isabelle Huppert, Jean-Louis Trintignant, Mathieu Kassovitz, Fantine Harduin, Toby Jones, Franz Rogowski | Rated R for some sexual material and language | Now playing in select cities. Opens Friday, Feb. 9, at the Regal Ballantyne in Charlotte, NC.